My two boys had been home together for a few days thanks to a mystery rash and a sore arm. By the fourth day I was going slightly insane… the arguing, the chasing, the punching, the standing on their heads on the couch! Obviously if they were feeling well enough to fight with each other constantly, so they were also feeling well enough to funnel that energy into something more creative! I needed to redirect the boy energy in a hurry so I just collected things I could easily grab. 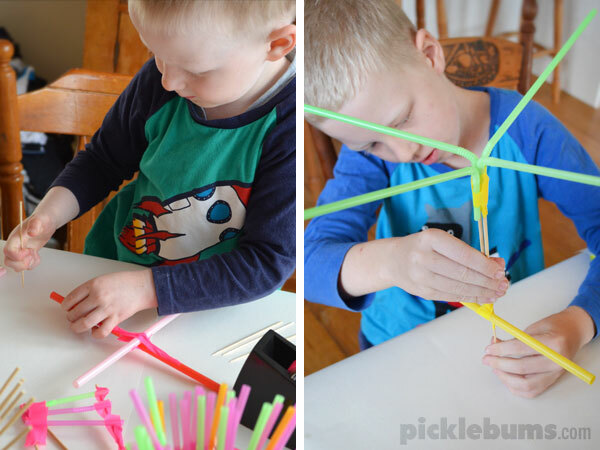 We used bendy straws and big thick straws (from Ikea) as well as long bamboo skewers and half size skewers. You could use any stick-like items you have around – we want to build with ‘real sticks’ next. You’ll also need quite a bit of tape for this. We are lucky to have been given lots of the lovely Collected and Co fluoro paper tape from Micador, and we went through four little rolls! That’s all you need – sticks and tape – which makes this a very low mess, easy set up, easy clean up activity. 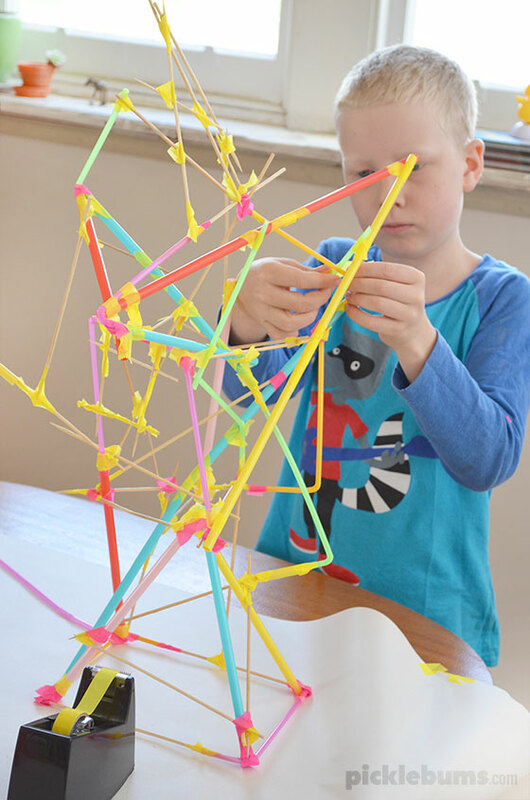 It was quite a challenge for both of them in the beginning, but it didn’t take the boys long to figure out the best ways to attach straws and sticks together. 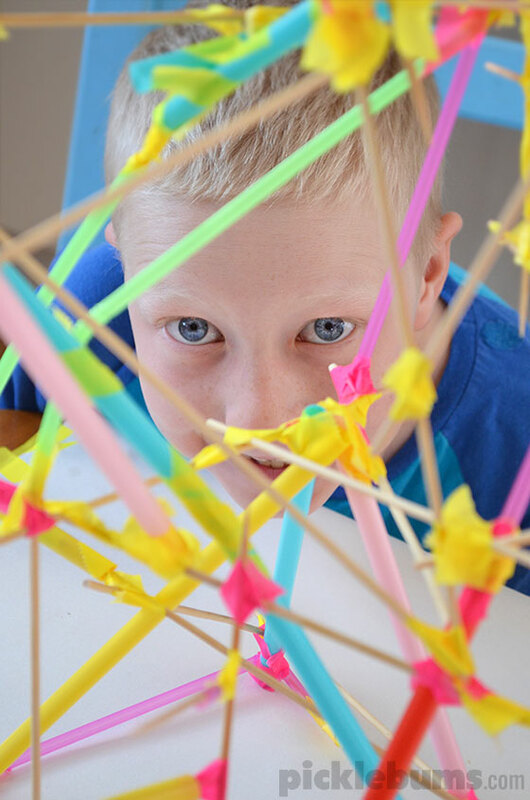 Noah (aged 4) managed better when creating objects flat on the table, but Morgan (aged 7) was keen to ‘build something big!’ and so he did. He kept adding levels, and shapes, and poking out bits, making sure that the construction was balanced and still stood upright on it’s own. Soon it was so tall he had to stand on a chair to reach the top level. Noah named the big tall construction ‘The Once-Lers House’ (he may be slightly obsessed with all things Lorax at present) and they both worked together for a while – Noah putting together squares or triangles and Morgan adding it to the construction. It certainly was a great way to engage my restless, want-to-kill-each-other boys for a little while! 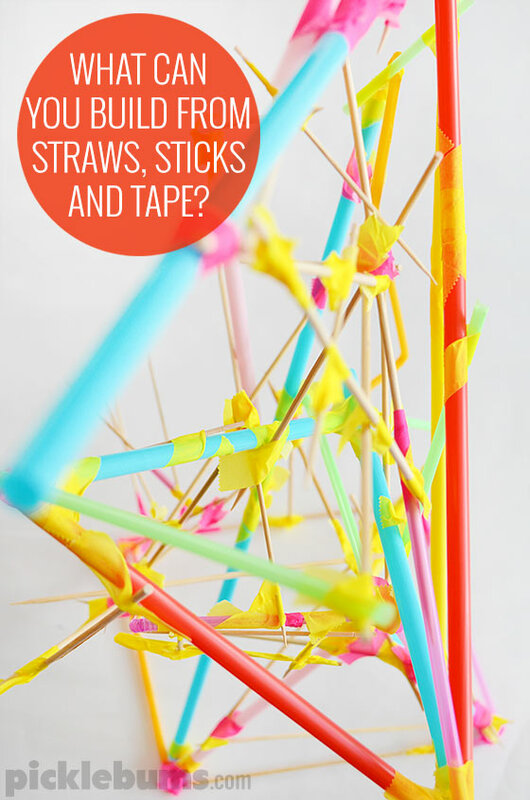 What would you build with straws, sticks and tape? This is such a fab idea Kate. 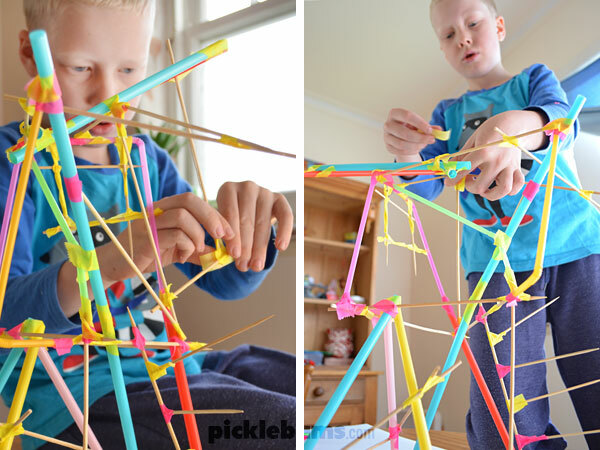 I can imagine your boys would have loved constructing with straws and sticks. Love the simplicity of it. 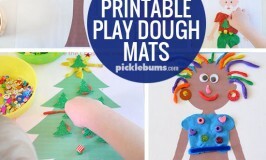 Great idea and great pictures! I LOVE this idea. 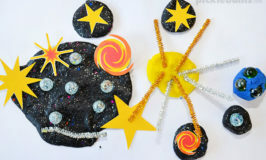 My 2 boys (5 and 8) would be in craft heaven doing this. I may have to find some stick alternatives as I wouldn’t trust my 5 year old with a skewer but I am totally going to do this in the next holidays. Thanks for the great idea Kate. Finally! Another mom who understands the endless energy of sons, but we LOVE our boys ! 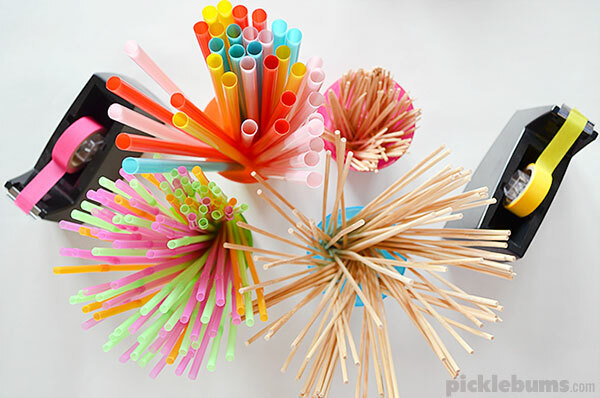 The best solutions in life are so simple… who would have thought so much creativity from straws and tape – NO expensive video games needed.